An interview on the origins of Islamic State and its relationship with regional and global powers. In order to explore the history of the Islamic State in its relationship to Saudia Arabia and Turkey, Haneul Na‘avi consulted Jeffrey Steinberg, senior editor and counterintelligence director of the Executive Intelligence Review. Steinberg has 40 years of experience working with the LarouchePAC, and is a member of and active contributor to the Schiller Institute in Wiesbaden, Germany. Click here to listen to the full interview. Haneul Na’avi: Can you give us a brief history of the Islamic State? How did they rise to power after the  US-NATO invasion of Iraq? Jeffrey Steinberg: You have to go back to when Zbigniew Brzezinski was the National Security Advisor to Jimmy Carter, and convinced the president to sign a secret authorisation to begin covert operations in Afghanistan, six months before the Soviets arrived, around Christmastime of 1979. Known as the Bernard-Lewis Plan, it involved promoting Islamic fundamentalism all across the southern tier of the Soviet Union. When the Soviets finally moved in, things became concentrated in building up a radical Islamic terrorist apparatus, sponsored by the US, British, Saudis, French, and Israelis. 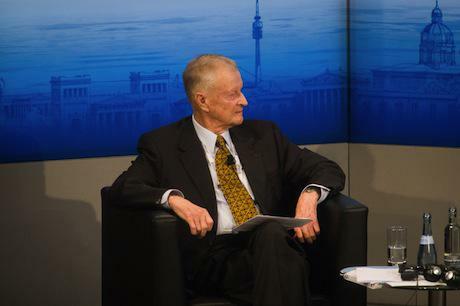 Brzezinski. Demotix/Theo Schneider. All rights reserved. The whole idea was to play Islamic fundamentalism against the ‘godless Soviet Union’, but the problem this created was the emergence of groups such as al-Qaeda. Osama bin Laden himself went to Peshawar in northwest Pakistan, near the Afghanistan border, as part of this Anglo-American/Saudi project to create a terrorist organisation against the Soviet presence in Afghanistan. That effort succeeded somewhat, but the consequences of that was the birth of an international Jihadi terrorist apparatus that is haunting the world today. You had the establishment of al-Qaeda following the US invasion of Iraq in 2003. Some of those networks in Pakistan and Afghanistan spread to other areas, including Somalia, [or] Chechen rebels in the Caucuses who then moved to Pakistan and Afghanistan and became some of the leading commanders of al-Qaeda. This in turn created spin-offs such as al-Qaeda in Iraq, in the Arabian Peninsula, and the Islamic Maghreb, many splits and permutations such as the Libyan Islamic Fighting Group, and the British and French backed those networks to overthrow Gaddafi, and now we have a mess in North Africa as a result. I was frequently on Capitol Hill in the mid-1980s, and you would see well-known neoconservatives touring with these so-called freedom fighters who later became leading figures in al-Qaeda. This is a long collusion between western intelligence agencies and radical Sunni Jihadist networks. HN: The Islamic State wants to expand its territory. How legitimate are their aims and what exactly are they trying to accomplish? Are they just controlled by the west or is this something more sinister? JS: Saudi Arabia is a kingdom that shares power between the House of Saud and Wahhabi clergy who are among the most radical fundamentalists of all the Sunni branches. In the 1960s, during the crackdown from Egyptian President Nasser against the Muslim Brotherhood, many of them fled to Saudi Arabia, joined the Wahhabis and began spreading a form of pan-[Islamism] around the world, with enormous financing from Saudi Arabia and other Gulf countries. They began opening up madrasas—special Islamist schools—in Pakistan, Afghanistan, and parts of Africa as early as 1963. You had the founding of the Muslim Worldly [League], the origins of neo-Salafism—a form of fundamentalist Islam with a messianic caliphate ideology, who received support from Arab Gulf powers, as well as British and US intelligence services, to be used against the Soviets and China. Al-Bagdhadi, the nominal head of IS, is committed to the establishment of a universal caliphate under [IS] direction. For that reason, there’s concern on the part of the Saudis with respect to the IS network, who could potentially overrun Saudi Arabia and incorporate it into their version of a caliphate. You had a merger in Saudi Arabia of the Muslim Brotherhood and Wahhabism, but later, when the MB entered democratic electoral politics in Egypt, the Saudis no longer liked that, and this created splits between different factions of Jihadism. IS inside Iraq contains members that have fought for over a decade—Chechens, Uighurs, Afghans, Saudis, Libyans, and Iraqis—who have travelled around the world in this continuous battle, honing skills in asymmetrical warfare. You also have in Iraq remnants of the old Hussein military that are deeply resentful that they were removed from any power-sharing in their country, and who have opportunistically joined the neo-Salafists. HN: [Turkey] wants to expand into the European Union, NATO and has one foot into the Arab world. What exactly are the aims of [Erdogan] related to these three fronts? JS: The Turks have been instrumental in the rise of ISIS [over the last two years]. There were several critical border crossings turned over to ISIS. They had training facilities inside Turkish territory, and integrated with smuggling networks that operate into northern Syria and Iraq, and [they] are integrated into the ruling AKP party and Turkish MIT, the equivalent of the CIA, headed by [Hakan] Fidan, one of the most trusted right-hand men of Erdogan. If you look at the AKP, it’s an informal kind of Muslim Brotherhood with many parallels. There are more radical elements than Erdogan, and former presidents like [Abdullah] Gül who was a more genuine moderate than him and [Ahmet] Davutoğlu. They’re playing a dangerous game; they’ve crossed swords with the US, and Washington and the Pentagon are pissed off at Erdogan. There was a meeting between military commanders of the anti-ISIS coalition. Not only did Turkey send a deputy to the meeting, but carried out a bombing campaign against the PKK along the borders of Syria and Iraq the day before. Washington and some European leaders quietly made sure that Turkey didn’t get a seat on the UN Security Council. Frictions are becoming severe, and some American military personnel asked, “Why is Turkey in NATO if they’re on the other side”? I think that the neo-Ottoman aspirations of Turkey in MENA trump its desire to integrate into the EU and are openly promoted by Davutoğlu. They’re not completely out of control. The Saudis are strong backers of IS and I am not convinced that they are an existential threat to the House of Saud. In the 1990s, bin Laden was protesting against the residual US military forces in Saudi Arabia after the first Iraq War, and then Head of Saudi Intelligence Turki bin Faisal sent a liaison to Afghanistan and funds once again flowed freely to al-Qaeda, granted they would attack America, but not the House of Saud. They’re perfectly capable of negotiating with IS. Things can change, but I’m not persuaded that we’re at that point yet. You have a lot of contending forces—Gulf states—that are working with the Muslim Brotherhood, who are training forces against Assad. What they’re attempting to do is to use militias with strong ties to Turkey and led by the Syrian Muslim Brotherhood. The “elected” government in Libya has allied with Egypt against the Libyan [Walter] Dorn Movement, which is backed by Turkey and Qatar. So, within the Sunni world, you have these fault lines that are becoming militarised, especially between Sunni and Shiite, which could easily turn into a regional war or even something bigger. HN: How will this affect BRICS and western players in the long run? JS: Several prominent Russians have made statements, one from [ex-Ambassador Veniamin] Popov that said, “if the US is serious about waging war with IS, then it has to be a coalition of countries with shared interests”. This emphatically includes BRICS; particularly Russia and China, for reasons such as the targeting of the Caucuses and Xinjiang provinces of western China, where the Uighurs are a part of this “Jihadists without Borders” apparatus. There are at least 1,000 Chechens that are fighting with ISIS in Syria and Iraq, who represents some of the most seasoned IS commanders. They’ve been in combat continuously for over a decade since the Chechen wars. Popov continued: “A serious alignment would involve the US, Russia, China, other BRICS countries, Iran and Syria”. You can’t trust Saudi Arabia or other GCC countries to genuinely try to defeat IS. If you had an alliance amongst those countries, you would have the resources to absolutely crush IS in Iraq and Syria. The Russians have a close relationship with the Syrians and Iranians, which could have genuine, direct coordination rather than the sneaky ones we have now. Egypt is a channel for feeding intelligence to the Syrian military, and the Iranians benefit from coordinated efforts between Iraq and the US, and Shiite militias, whom are some of the most effective fighters there. Ultimately, [IS] has approximately 30-50,000 fighters in the region, and they’re relying on former Ba’athist military personnel in Iraq and Sunni tribes in Anbar who will go where they think the winner is. They’re not ideologically committed to the Islamic State and don’t believe in a caliphate; they’re just pissed off because they’ve been cut out from the power share in their own country and are demonstrating that they have more military ability with IS than with the Iraqi government. The minute those tribes see a fairer power share and are convinced Islamists will suffer defeat…they’ll switch sides. You’ll have a replay of the Anbar Awakening from the mid 2000s, so there’s a limit to how far IS can go before overstretching themselves. They don’t pose a threat to overthrow Putin in Russia, or Xi Jinping in China, but can make a mess of things. The problem you’re dealing with is that the British, factions in the US, and the Saudis still continue to see this as an Islamic card they can play against the Russians and Chinese. If they are freaked out by what BRICS represent since the July meeting in Brazil, that’s where you can see these asymmetric operations—the air-sea battle against China and supporting neo-Nazis in Ukraine targeting Russia—you do see a situation where a general war does become a world war.